Good Behavior TV Review - Michelle Dockery Amazes In Massive Leap From Downton - Are You Screening? 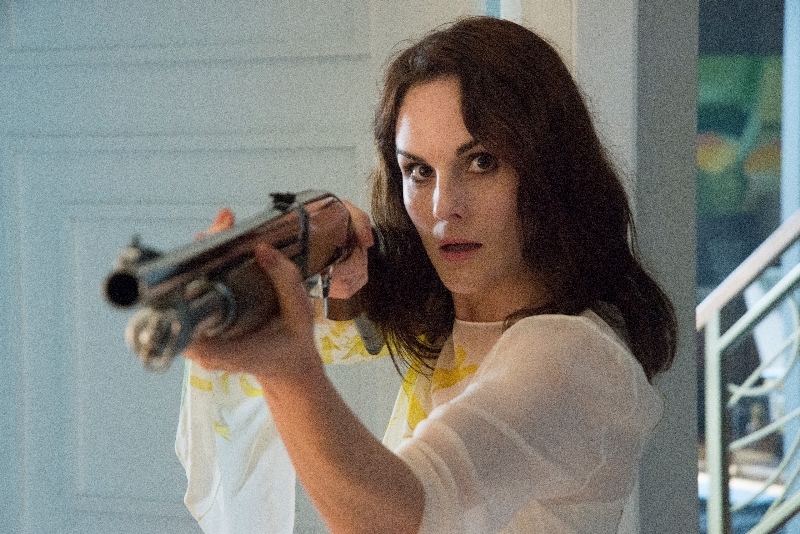 TNT‘s Good Behavior is going to be a show that surprises a lot of Michelle Dockery‘s fans. After taking over the television world as Lady Mary Crawley, Dockery now plays something very close to the opposite character. You can watch the entire first episode of Good Behavior below! Based on the Letty Dobesh series of books by Blake Crouch, the show follows Letty Raines (Dockery), a woman who is out of prison for good behavior. There is a certain sense in which she is actually interested in becoming a better person, but is a sense that isn’t easy to recognize and is prone to absentmindedly wandering off. She isn’t doing so hot when it comes to finding gainful employment and keeping drug-and-alcohol-free isn’t going so well either. That’s actually more of a problem for her parole officer (Terry Kinney) than it is for Letty, because she’s working a decent gig ripping off hotel guests. Unfortunately, she gets caught in the wrong room, and overhears a hitman, Javier (Juan Diego Botto), being hired to kill a man’s wife. Naturally, being a con-woman, thief, drug addict, and general great gal, she takes it upon herself to try to mess up the scheme and save whoever this woman is. It’s an odd decision, especially for what is practically the opening sequence of the series, and it goes wonderfully unexplained. This is a show that may seem like a run through fairly bizarre events, and it is, but it’s really a character dissection the likes of which is rarely seen on television. Even with that understanding, the show’s progress is likely to be uncomfortable for many viewers, simply because we are largely only given the opportunity to peer through the microscope. Letty gets a chance to talk to her parole officer, her mother, and we do see her talking to other people along the way, including Javier, but it all only amounts to watching her. If we stuck to the mold, Letty would have a best friend, and probably someone she didn’t especially like who was working as her apprentice con/scam artist. This would let us watch a lot of conversations, during which Letty would talk about her motives and feelings, and possibly explain her plans. Good Behavior couldn’t care less about such nonsense and doesn’t care if you’re looking for it either. It becomes a primer for why people keep saying you should show and not tell, and the fact that the pacing and plot development feels off just goes to show how infrequently anything comes along that actually sticks to that adage. If there were no other benefit to the show’s theory of storytelling, it would be worth it for the first episode’s final scene. This is a dark show, rich with the nuances of lives we aren’t used to seeing and mostly imagine in “TV terms.” The scene in question is powerful, theoretically, but if it had a more traditional build, it would have fallen flat by the time we got to it, no matter how we tried to tweak the system, and Letty would have become comical. You can’t tell an audience who a character like this is. There’s no way to make it believable, and it’s probably impossible to get viewers to care what’s happening to her. Dockery is almost freakishly believable in every moment because the show lets her display the character, instead of trying to figure out how to deliver lines in a convincing way. There’s a moment when we get caught up in Letty imagining that she will do something, which then snaps back to the present time and we watch her not follow through on that course of events, and if you don’t get pulled in by then, you never will. It’s a brilliant scene, because as we watch her going through the steps of this plan, Dockery manages to make things ring false. It isn’t until we are pulled back to “reality” that we are aware she isn’t doing these things and the shock of the miscue makes perfect sense. A show, and actress, that can actually translate that experience from page to screen is a hook you can’t buy. It defines binge-worthy, and getting you to this stage of character acceptance in one episode is like a lightning strike. If the show has a downside, it’s the battle of wills inherent in the show’s dark world fighting for purchase as it wants to get you to like… something. That’s particularly difficult because it isn’t clear that it actually wants to get you to like anything, or anyone, but it seems to be aware that it is supposed to aim at such an effort. Letty is unlikable, as her own self-image tapes will attest, and while many viewers will love her, rewatch her, and buy the T-shirt, there’s a chore ahead for others. Flawed characters aren’t that hard, but Letty can’t seem to get to the bottom of the bag she carries them in. All of this may sound like the description of a college course you never wanted to sign up for, but the show is also a lot of fun. It’s a fun that’s as hard to describe as anything else about the show, but the ride Letty is about to embark on is as odd as she is herself. Michelle Dockery is hoping to take over television again. It's a trickier run this time, but just as worthy.